Shadows lurked at the edge of the circus camp spread around the black mountain of the Big Top pitched beside Shady Creek in a field outside of Sarasota, Florida. The evening cooking and warming fires of the circus people mingled bacon smells with wood smoke and waves of warm air. The railroad tracks marched across a distant meadow with the circus train stretching out on them like a pencil line. One of the shadows materialized into a gypsy wagon with rickety wheels, chipped red and blue paint, faded orange letters, and a scattering of white stars circling a black crystal ball decorating its weather worn sides. Madam Cecelia sat in the oval doorway of the wagon holding the original black crystal ball in her hands. She turned the evening cool, smooth crystal ball over and over and she held it up to the light from the small fire burning in front of her wagon and admired the patterns of the flames as they danced across the crystal ball’s surface. Then the texture and temperature of the ball changed. It began to warm up gradually like a frozen hand thawing out in a mitten. Soon the crystal ball became too warm for Madam Cecelia to hold and she dropped it on the seat beside her..
Madam Cecelia stared into the crystal ball and she saw Bettina doing a back flip at the dinner table. “I’m going to find Uncle Andy and join the circus!” Bettina said. Bettina knew exactly where to find Uncle Andy. She read in the Sarasota Spectator that circus owner Robert Ringling had done something different this war year of March 1944. Instead of following the usual custom of dress rehearsing his show in New York, Robert Ringling decided to try out his company right here in Sarasota, Florida. He called his production staff, performers, and musicians to the circus winter quarters and rehearsed and practiced them for weeks. Bettina had read about it in the Sarasota Spectator every day for the past three months. Today, March 26, 1944, the Sarasota Spectator reported that the Ringling Brothers Barnum and Bailey Circus had performed without a hitch and all of the proceeds were going to charity. This would be the last night in town for the circus. It was heading East to New York and then on to Hartford, Connecticut in July. Bettina’s cousin Frank had told her that Uncle Andy had been an acrobat with the circus for six years and she had seen his name in the Sarasota Sentinel. Bettina’s eyes lit up like she had swallowed a fire cracker. She choked on the tea that she had began to sedately sip to please Papa. Papa set his tea cup into its saucer so hard that tea sloshed over the edges unto Mama’s white lace tablecloth. “Dreams aren’t absurd, Kenneth. It takes faith and imagination to dream,” Mama said. Bettina wanted to shout, “You just hate me because I didn’t die instead of Philip. You love boys better than girls.” But she knew that Papa still cried about Phillip in his study at night when he didn’t think anyone was listening, so she couldn’t shout at him. She bent her head over her bowl of tomato soup and watched two tears plunk into the soup and widen into ripples. Mama hurried to the kitchen to get a tea towel. She dabbed her lace tablecloth with it. “I’m sorry, Helen,” Papa said, grabbing the other end of the towel and dabbing at the tea stain that invaded the tablecloth like a fire licking the edges of a piece of paper. He dabbed at the stain with his end of the towel. “I’ll get you another lace tablecloth, Helen.” He ignored Uncle Andy. Bettina watched Papa and Uncle Andy walk to the study. Papa looked and acted like he was walking into freezing water. In the kitchen, Mama handed Bettina the dish towel with one hand and a pair of patched brown knickers with the other. “Now, if I can just calm your father down enough for you to practice,” Mama muttered as she and Bettina did the dinner dishes. By the time they were finished, Mama had an idea to calm Papa. She told Papa she had a rose problem and since Papa liked roses so much, he went to the rose garden with her right away. Wondering why Mama and Papa were ignoring Uncle Andy, Bettina put on Frank’s patched knickers and one of Papa’s shirts and rushed back into Papa’s study. Uncle Andy showed Bettina the fine points of somersaulting, back flips, and hand stands. It seemed to Bettina that all Uncle Andy had to do was show her the acrobat moves and she was doing them. She flew through the air, she turned and twisted. Bettina was flying! Bettina was so happy with her acrobatics and Uncle Andy was so happy with his teaching her that neither of them noticed Papa until he stomped through the door and grabbed Bettina in mid somersault. He sat Bettina down on the floor so hard that her teeth chattered. “Go upstairs and take off those knickers at once!” Papa shouted. “But me and Uncle Andy –“Bettina protested. “Don’t you mention his name in this house again,” Papa roared. Uncle Andy left and so did Bettina. Uncle Andy went out the front door, slamming it behind him. Bettina went into the closet in the hall and got out one of Phillip’s old baseball caps that Mama had put there. Bettina put on the baseball cap and climbed down the rose trellis that Mama had put up outside her window. Using her newly practiced crab crawl, she climbed down two stories, careful to use the toeholds in the trellis. Then she hurried toward the circus grounds on Sherwood Avenue, looking for Uncle Andy. Madam Cecelia stared into the crystal ball and she saw Bettina running toward the Big Top. “Bettina, why are you here?”As Bettina ran closer, the crystal ball again changed temperature from warm to so hot that Madam Cecelia dropped it and waved her hands in the air to cool them off. “I know all. I see around knickers. I see under baseball caps. I see into the future,” Madam Cecelia intoned. “Your turban is on crooked,” Bettina told Madam Cecelia. “Most girls don’t join the circus but I’m not most girls. I wear knickers and turn somersaults and I’m going to find my Uncle Andy and I’m going to join the circus with him,” Bettina said. “Come inside, then,” said Madam Cecelia, beckoning to Bettina. Your Uncle Andy is busy carrying water for the elephants, but we can wait for him here and maybe fix him some supper.” She patted the wagon seat beside her. At first Bettina hesitated, but when Madam Cecelia looked at her like she was a timid girl, Bettina climbed up beside her on the wagon seat. Madam Cecelia handed her the crystal ball. “Hold this while I go inside and get some sausage to fry for supper,” she said to Bettina. Bettina stumbled across the dark field, her feet tripping over roots and the uneven ground. Once she stumbled into a rabbit hole and had to struggle to get out. Her ankle twanged painfully, but she kept running. Finally, she reached the edge of the woods. The wall of trees, as solid as the black bulk of the Big Top, seemed to rush to meet her, their branches reaching out to grab her and pull her into their thick scratchy arms. Although she was wearing her knickers, Bettina shivered like she had seen her girlfriends Sally and Janet shiver when they were afraid. She also had seen her cousin Frank whistle when he was afraid, so she shivered and whistled both, as she took three steps into the woods. She could see twigs and small branches on the ground and she quickly gathered up an armful and turned to run away. Then she saw it, a bright red glowing light coming toward her and growing larger and larger as it drew nearer. Bettina stopped whistling. The glowing red light was a red dragon with fire shooting from its nose and claws, flying faster than she could run. Grasping her firewood closely to her chest, Bettina ran for the edge of the woods, with the fire breathing dragon chasing her. Bettina thought that the fire breathing dragon wouldn’t follow her out of the woods, but she could feel the dragon’s breath on her neck as she raced across the meadow. The fiery breath of the dragon singed her hair and she did several somersaults to get further ahead of the dragon. Bettina was so out of breath she couldn’t even shout for help as she ran past the cooking fires of the circus people camped for the night. Still clutching the firewood, Bettina did one giant somersault and landed in front of Madam Cecelia’s campfire. She stood up from her somersault, dropped the wood in front of the fire, and panting and wheezing, she pointed to where she had last seen the fire breathing dragon. “There’s no one there,” Madam Cecelia said. “Thank you for getting the wood. And Andy is here!” She pointed to her crystal ball. Bettina stared into the crystal ball, but she didn’t see anything but her own reflection. The man with the shoulders like barrels pulled Bettina along by the arm and then into a nearby barn where two elephants stood flinging hay into the air. He handed her two buckets. Fill these with water from the creek near the Big Top while I feed them some carrots and toss some hay for their beds. 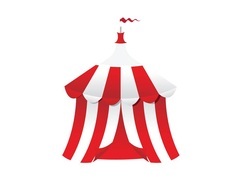 Bettina carried the water buckets past the camp fires of the circus people and soon she saw Shady Creek, so small that she was tempted to somersault across it, running past the Big Top. Instead, she knelt on its banks, and filled the water buckets. As she stood up and picked up the water buckets, Bettina’s eyes rested on the near the peak of the Big Top. She stared as she saw a thin line of fire spread across the canvas like water soaking into a sponge. Bettina hauled her buckets of water to the doorway of the Big Top and stood on tiptoe, trying to throw water on the fire. “What do you think you’re doing?” The man with shoulders like barrels stood beside her and grabbed a bucket from her hand. “I’m trying to put out the fire. Don’t you see it?” Bettina waved frantically at the top of the Big Top, but there was no fire, just a smooth expanse of canvas. Bettina refilled the water buckets and hurried back to the barn. She heard the elephants trumpeting as she got nearer to the barn, and she put the buckets of water in front of the elephants and watched them take long slow drinks. Suddenly, one of the elephants took a long drink of water in its trunk and squirted it at the other elephant. Bettina laughed as the other elephant retaliated and both of them squirted water at each other. She kept laughing as she traveled back and forth to the creek for five more buckets of water so the elephants would have enough water to drink and squirt. After she had finished watering the elephants, Bettina went back to Madam Cecelia’s gypsy wagon. She had to find Uncle Andy and if the crystal ball could tell her where to find him, she would pester it until it told her. Madam Cecelia didn’t open the door. Bettina stared into the shadows. “Suddenly, she felt afraid. What if the fire eating dragon came charging at her from the other side of the fire? Bettina folded her hands and cracked her knuckles. She could somersault away from the dragon again if she had to do it! She tried not to be afraid. After all, Papa had told her many times, his voice dripping with scorn, that girls and women were timid creatures. Madam Cecelia stepped out of the wagon and sat on the front seat. She stared sternly at Bettina. “The crystal ball glows in the dark,” Madam Cecilia, said, handing the ball to Bettina. Bettina took the crystal ball in her hands and light shone through it and colored her skin like the moon shining behind the clouds. The crystal ball lit the faces of all of the circus people she walked by searching for Uncle Andy, but the crystal ball didn’t shine its light on Uncle Andy’s face because Bettina didn’t find Uncle Andy. By the time she returned from her searching for him, the sun had begun to send fingers of light across the sky and all of the circus people had doused their campfires, packed up their gear, and boarded the circus train. The trainers had loaded all of the animals, including the two elephants. Bettina felt more afraid than she ever had when the fire breathing dragon had chased her. She felt so sad that she didn’t even want to turn somersaults nor do back flips. She just wanted to find Uncle Andy. Suddenly, the crystal ball stopped glowing. It went completely black and it felt as cold as Bettina’s hopes. Slowly, she walked back to Madam Cecelia’s wagon, but Madam Cecelia, too, had gone along with her horse and wagon. The only sign that remained that she had been there was trampled grass and the black circle where the camp fire had burned. Bettina heard the train whistle in the distance. “What do you want me to do with your crystal ball?” Bettina shouted. The mournful whistle of the train answered her question. Bettina took the crystal ball home with her and hid it in her closet underneath a pile of pink dresses. She felt its magic smoothness as she listened to Papa’s scolding and returned Mama’s warm hug. Papa scolded, but now he sat by the fire with her in the evenings and told her stories about when he and Uncle Andy were boys. Andy was always an acrobat and Papa, Kenneth, the serious and responsible person. “You’re a lot like him and you’re a girl. And Philip - That’s why I’m so hard on you,” Papa, said. He started to say something else, but his voice choked up and he jumped up and hurried to his study. Bettina knew that he was standing by the window blowing his nose. She could hear him. The next morning was Saturday, so Bettina didn’t have to hurry off to school. She went into Papa’s study. She knew he would be sitting in his arm chair reading the Sarasota Sentinel. Papa was sitting in his arm chair, the Sarasota Sentinel folded across his knees. He held his blue and white polka dotted handkerchief to his nose and blew loudly. Bettina ran over and threw her arms around Papa’s knees, and the paper fell to the floor. “Papa, why are you crying?”she said, picking up the newspaper and handing it to him. “Read this,” Papa said. He handed her the newspaper and pointed to a paragraph on the front page that he had circled with a black crayon. Bettina read the paragraph. It said that the Ringling Brothers Barnum and Bailey Circus was honoring Andrew Yonkers, formerly an acrobat with circus, who had died when he fell from a trapeze a year ago to the day. Papa was sobbing so hard that he couldn’t answer her. Bettina sat in Papa’s lap and hugged him until he stopped crying. From that day on, Papa had Bettina practice her acrobatics in his study. For days at a time, Bettina forgot about the crystal ball hidden in her closet. Then, on the night of Thursday July 6, 1944, after she had spent the day practicing somersaults like Uncle Andy did and after she had bathed and changed into her night gown, Bettina saw a glow through her closed closet door. She got out the crystal ball and rubbed it. The ball began to vibrate with a faint tinge of light, like the sun rise over the ocean and then it glowed a deep, fiery red like the fire breathing dragon. Bettina saw the Big Top and this time instead of a narrow ribbon, the Big Top blazed with banners of flame that waved in the wind and spread across the canvas. Bettina saw an acrobat turning flips and cutting doorways in the Big Top canvas so that frightened children and their parents could escape from the burning tent. The next day, Bettina went to the meadow at the edge of the woods where the circus had spent the winter. Madam Cecelia’s wagon stood parked in its old place and Madam Cecelia, wearing a green and red polka dot turban, sat on the seat, smiling at Bettina. Madam Cecelia hugged her. “It will be here when you need it again,” she said. Bettina turned somersaults all of the way home.